Hotel ibis Rostock am Stadthafen. Book now! Internet! 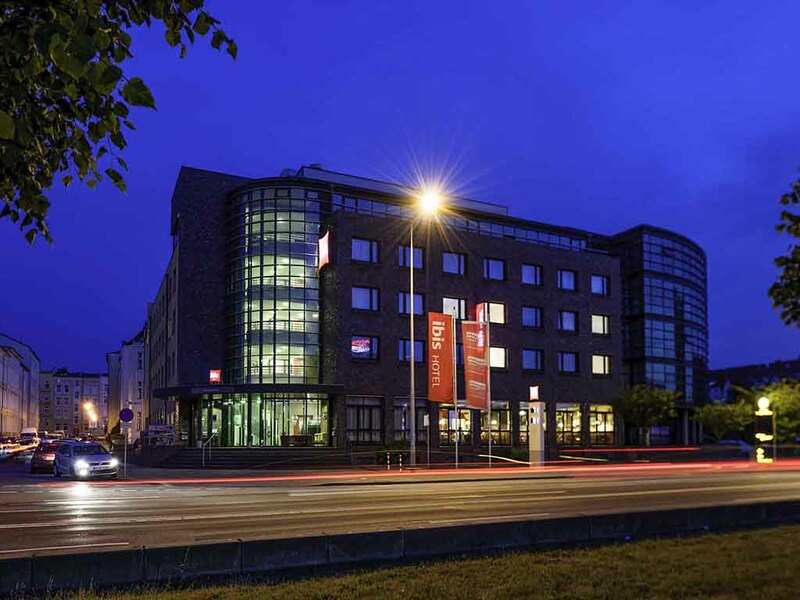 The city hotel Ibis Rostock is located in the city center, on the banks of the river Warnow. All of its 91 air-conditioned rooms offer high-speed Internet access and you can surf for free using the iPoint in the lobby. Three meeting rooms are available, o ffering space for up to 60 people. Our friendly reception team is available 24/7, as is our gastronomic service. We serve a delicious breakfast between 4am and 12 noon with regularly changing seasonal buffets. The hotel is directly on the harbor, between the harbor-side terraces and the 'Volkstheather'. The stadium is 15 mins away. Ideal for early risers, night owls and anyone stirring in the night: Our bar is open around the clock. Our team serves drinks, refreshments, beer, delicious snacks and crispy paninis. Featuring live sporting events on Sky. WIFI available free of charge. Friendly staff and good value. Standard Ibis room but electrical outlets were hard to find and not easily accessible. How hard would it be to put an outlet by each side of the bed? Reception staff, by the way, were very nice. Very clean, good location and friendly personnel. High frequency humming noise in the room and all optional rooms, ended only when taping the ceiling speaker. Bathroom silicones and installations old and kinda run-down. Breakfast okay-ish, quality halfway bearable, fresh orange juice would have been preferable. Shower soap disgusting. I had a nice stay at the Ibis Rostock. Since I was there on a Wednesday night, there weren't very many other guests and it was very, very quiet. I found it especially nice that they gave me a welcome drink, which I gladly used to get a bottle of water. All staff were friendly and check-in/check-out was quick and easy. Will probably stay here again next time. Personal were nice, beds wellmade,shower working but the AC didn t work at all. Excellent breakfast. Warm bread and a broad variety of food. Since we did not know the public traffic network around the hotel and from the central station, we walked to the hotel upon arrival. On the way back from the hotel to the central station we took the tram from the station nearby the hotel. Room reservation by email. For my part correspondence in English - answers from hotel in german ... ??? On the spot disappointment ... in the email I provided info that I would pay in cash. My credit card was charged. Someone did not read the email? I sent the data to the account by e-mail. Invoice has been printed with errors. My colleagues left the jacket in the lobby in the evening. On the second day the jackets were not given to them. Most likely the jackets were stolen at the front desk staff. The staff at all do not feel responsible for the things left by hotel guests. This category of hotel is not to be imagined. Fine hotel all went well. Rooms are basic, but well arranged and equipped. The room A/C was not working and the room was warm despite opening windows, as advised by reception. The room was great and very clean. Breakfast was tastefully and the people at the reception and bar were very friendly. Also the ladies at the breakfast buffet. Warm room - air-conditioner was not effective at night and thus could not sleep properly. Could not open the window due to traffic noise. Wifi signal was very poor in the room 433.